Tickets to BISV performance of Disney's Aladdin on sale now! 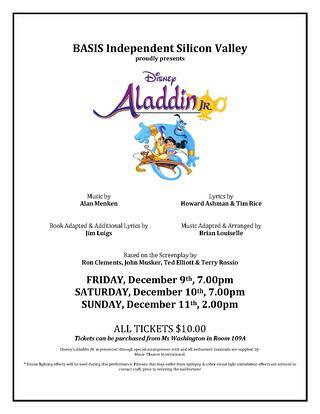 BASIS Independent Silicon Valley is proud to present our annual school-wide musical ‘Disney’s Aladdin’. Tickets are $10 each and are now available for all shows. Capacity is limited so get in quick! Should you wish to secure tickets, please send your students to school with either cash or a check made out to BASIS Independent Silicon Valley for the number of tickets you would like.